Late night or early morning running is a great way to stay in shape, but it's an activity that can be challenging and potentially dangerous without the proper equipment, namely a quality running light. Handheld lights will ruin your arm-swinging motion and are impossible to hold steady. To ensure you have a consistent, effective light source, we believe a compact headlamp is the only truly reliable light source for running in the dark. Whether you're running on a trail or alongside the road, it's important to keep your path clearly visible while keeping yourself visible as well. 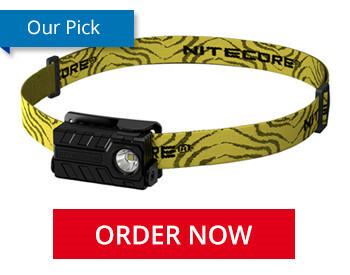 Therefore, a headlamp with plenty of power (at least 100-120 Lumens) and runtime (at least an hour) is an absolute must. Considering your head will be bobbing up and down with every step, it is important to choose a headlamp that fits both securely and comfortably. Smaller plastic headlamps are typically lightweight and move minimally while you run. The final piece to a quality running headlamp is durability; Mother Nature can be unpredictable so you'll want a light that can get wet and still function properly. For more information on our selection process, click here. As a company, we pride ourselves on our extensive knowledge of our product lines. And we are not just experts in the products we sell, but customers as well. We get the opportunity to be some of the first to test out these lights in our personal lives. With several of our employees having tested dozens of different headlamps for late night running and walking, we've been able to narrow down the qualities they found make the best running headlamp! We even included an assortment of reflective and light-up accessories to ensure you stay clearly visible during your nocturnal workouts! Out of all the headlamps we offer, the NU20 lines up best with all the essentials we believe make an exceptional running headlamp. Comfort is absolutely key in a running headlamp and the NU20 is one of the most comfortable headlamps we've ever tested, featuring an extremely compact and lightweight design and a breathable nylon headband that adjusts snuggly to any head size. Its body is completely waterproof, so it's safe to use in poor weather conditions. It emits a 360 Lumen beam that spreads 100° wide and can throw further than 250 feet, giving you a clear and complete view of your path. While its runtimes didn't quite match its specs when we tested it, the headlamp still provided more than enough for extended use with absolutely no dimming. The light is designed with a built-in rechargeable battery pack so you can just plug it in at the end of your run. On top of all that, it's one of the most affordable headlamps we offer, so you won't be breaking the bank just so you can break a sweat after dark! What's all this other stuff? While we believe the NU20 is the best choice for most runners, we know everyone has different preferences. Whether you want something a bit sturdier, something with a red LED, or simply a different style, we've made a list of our top choices so you can pick for yourself! To ensure maximum visibility, running headlamps should produce broad, far-reaching beams to keep your entire line of sight clearly visible. You should never need to worry about a potential pothole twisting your ankle or a sharp turn in the trail catching you by surprise. A wide-angle floodlight is ideal for runners, keeping your entire field of vision lit without any hot spots that could blind or distract drivers. In addition to enhancing your own vision, a bright light will make sure you're clearly visible to oncoming traffic, keeping both you and the driver safe from possible accidents. Many of our headlamps also offer flashing outputs to keep you noticeable when you don't necessarily need to light your path. Even if the sun hasn't fully set or you're running underneath street lights, it's always a good idea to bring your own light source to keep both you and your path fully visible. The last thing you want on a late night run is for your headlamp to run out of juice. That's why all of our running headlamps feature lengthy runtimes, each able to provide sufficient light for nighttime running for at least an hour, most for much longer. We even offer a number of rechargeable lights that you can plug in when you return from your run, ensuring it's ready the next time you want to do a little late night exercise! All of our running headlamps feature battery compartments either inside the lamp or directly opposite the lamp on the back of the headband, keeping the weight of the light balanced on your head. Comfort is one of the most important characteristics of a quality running light, so all of our running headlamps and gear are designed to be as comfortable to use as possible for their user, from their weight to their actual shape and design. Lightweight and compact designs are key for any running headlamp, allowing you to focus on your workout and not the bulky light strapped to your head. All of our headlamps also feature comfortable, easily adjustable headbands that will stay securely fastened to your head, preventing the lamp itself from wobbling and rubbing against your forehead. A little rain would never stop you from getting a good workout in so why should it stop your light? All of our running headlamps are certified to be water resistant, many of which can even be submerged underwater without damage, so they're ready for whatever Mother Nature can throw at you! Choosing a running headlamp that will last is equally as important as choosing one that is bright, so we made sure all of our lights meet both qualifications!